It doesn’t matter if you’re just starting out or if you’re a pro. 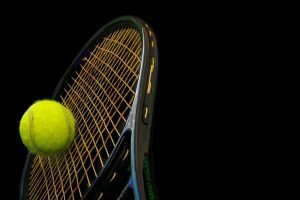 In tennis, the number one element that can make a difference besides your skill or stance is using a racquet that will complement your playing style. Beginners may turn their heads at first, wondering why they should research and invest in a good racquet, but the truth is, a good racquet can make a huge difference in your playing style. A good racquet can give you increased power, more control, and even more forgiveness. As long as you choose a good racquet, you can improve your game. This leads you one step closer to becoming just as good as intermediate players. 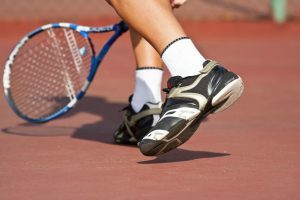 In this article, we will discuss the best tennis racquet for beginners. If you’re interested, then keep reading. The Wilson brand has been making tennis racquets for years, thus giving its players the best tennis racquets on the market. If you’re just starting out, you’re going to want to check out Wilson's tennis racquets. These are designed to be easy to use and affordable, meaning you won’t have to shell out a lot of money. They come a long way from the cheap plastic models you get when you’re just starting out. The Wilson brand continues its heritage with the design of the Wilson Federer Racket, which is made with its players in mind. The Wilson Federer Racket is designed to give you more power and increased depth from every direction on the court. 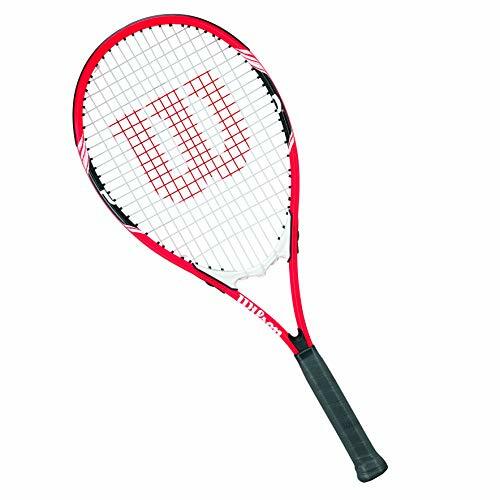 Wilson has enhanced this racquet with its new and improved Arc technology which gives you, the player, increased stability. This result in increased stability allows them to install a stronger string bed. This allows the racquet to produce high amounts of power when you swing back and still gives you comfort while gripping the paddle throughout the match. 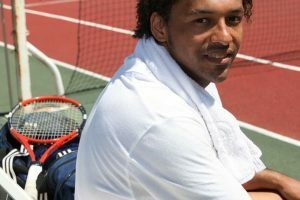 If you’re just starting out on your tennis journey, then the Oppum brand may be a good place to start. 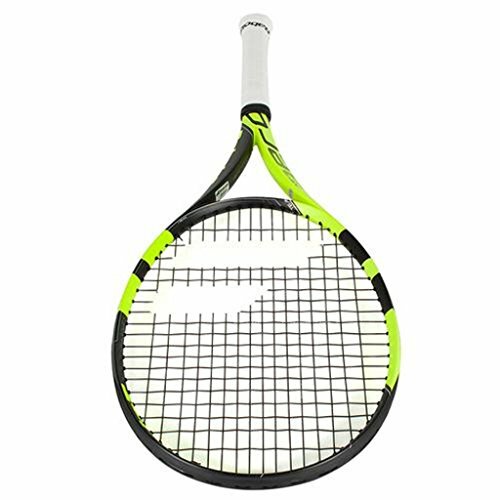 Not only are their racquets affordable, but they also come with many unique features that can help increase your gameplay. 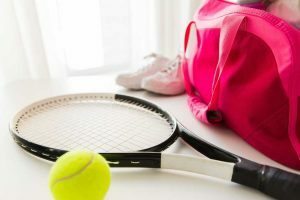 If you’re looking for a tennis racquet that is designed for both men and women, then this racquet might be your top pick. It’s designed to be durable, strong, and have good shock absorption. This brand also allows you to choose what color you want your racquet to be because it comes in a variety of colors. If you’re not satisfied with your purchase, there is a 100% money-back guarantee. 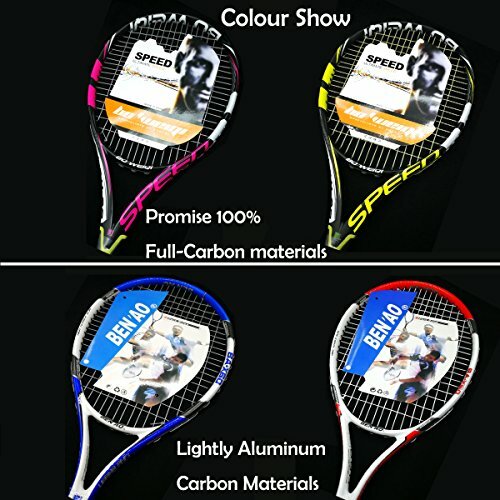 The Oppum Tennis Racket is designed as either a 100% full carbon fiber racquet or as an aluminum carbon tennis racquet. It has a 4 ⅜ inch grip handle, which makes it perfect for both men and women. The racquet has an increased integral forming structure, a lightweight build, and a strong frame. It has good shock absorption and doesn’t hurt when you’re serving the ball at maximum strength. It has a large racquet face, which means you have more forgiveness when you aim wrong while serving the ball. 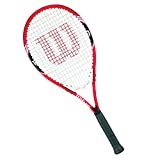 1.Triangular Structure and Comfortable Wooden Handle Double Shock Absorption: This tennis racket uses a triangular-shaped frame to absorb shock. The combination of the handle and the face is a triangle that has a firm effect and absorbs bad vibrations, making the batting more comfortable. It also comes with a wooden handle t, plus a shock-absorbing hand glue. It can double filter bad vibration and improve the comfort of the handle grip. Let you switch the racquet angle more freely. 2. Independent Hole Position, Double Hole Technology Threading: Each threading hole on the racket adopts independent rubber hole position and is threaded by double hole technology, which not only has beautiful appearance, but also makes the racket more stable and durable. This independent small hole threading not only can better protect the ball line, extend the life of the racket, but also maximize the elastic effect when you hit the ball, giving you a good sports experience. 3. Carbon Fiber and Aluminum Metal Double-Mix Material: The racket frame is made of carbon fiber and aluminum metal mixed material, and the handle is wooden handle. 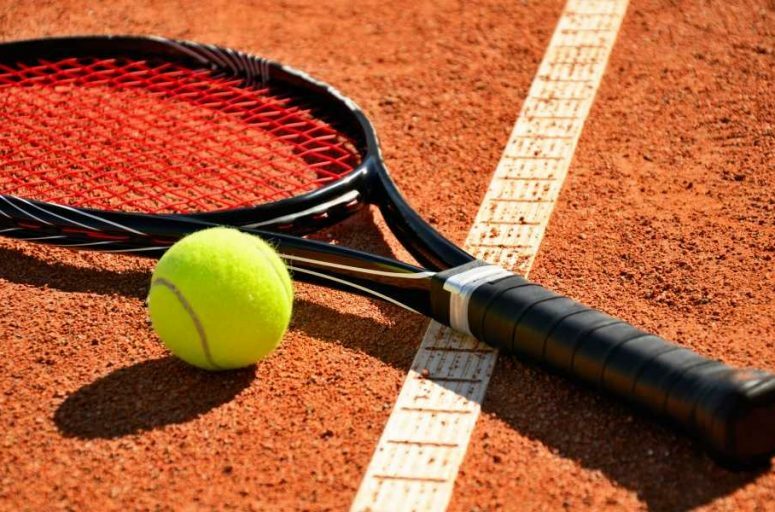 The racquet face has a highly durable mesh belt, which improves the performance of the racquet and increases the strength and stability of the ball. 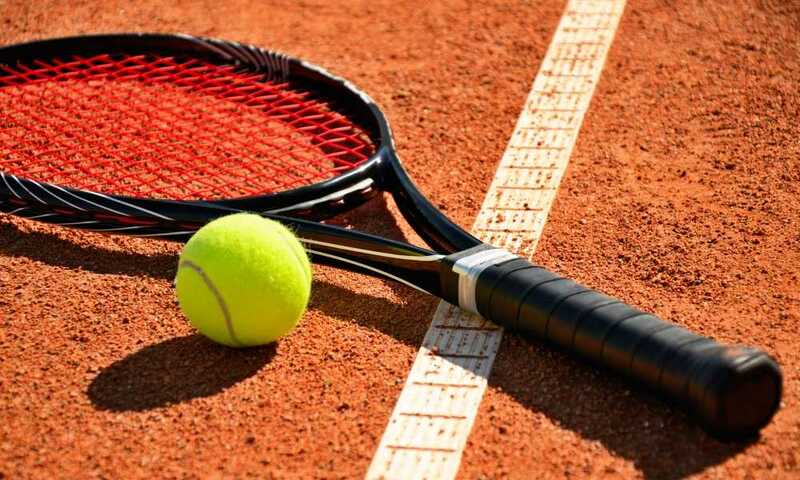 Whether it's the material of the racket frame or the paint on the outer layer of the racket, its quality and weight are very high, giving you a good tennis game experience. 4. Lightweight and Comfortable Experience: Weight of the unstrung adult tennis racket is about 0.61lb,very light. 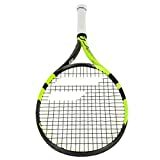 The tennis racket length is 685mm, Face size is 100 inch square and grip size is 4 3/8, this size suitable for all men and women, good idea for professionals and beginners.You can enjoy the tennis ball game longer and do not have shoulder pain caused by other heavier racket.The package include 2 rackets, 1 carrying Bag, 2 tennis grips, can bring you a convenient sports experience. 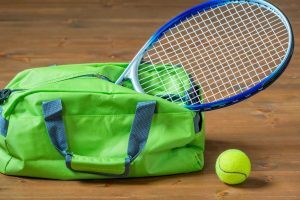 5.Quality After-sales Service: This tennis racket is particularly affordable and the quality of the racket is guaranteed, especially for beginners and entertainers. You can use this racket with confidence, which can give you a good sports experience. If there are any quality problems with the racket, you can contact us. We have the best service team to solve all customer's questions and problems. When you’re on the tennis court, get ready to use the Head Ti. Conquest Racket. It has a high-tact grip that improves your control and swing. That's due to the new nano titanium construction; you’ll be able to get increased stability and control. It also is designed to be light enough but also strong enough to increase the power of your swings. The enlarged head means you’ll have a better boost to your performance and more forgiveness if you happen to miss aim. This is perfect for improving your game if you’re just starting out. The Head Ti. Conquest Racket has an oversized head which can help you increase your accuracy if you’re new to the game of tennis. The head is a rounded shape, giving you that same classic feel as other tennis racquets. It’s constructed from nano titanium technology which provides a more sturdy and powerful racquet. This is great for any beginning user who has moderate swinging speeds. 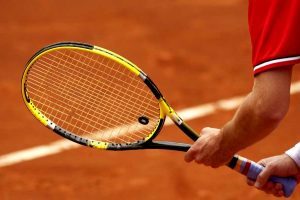 You should take note that because this racquet is on the larger end, it may be harder to keep swinging during a long match, so keep this in mind. The Babolat Pure Aero Team Racket is a newer and improved version of their famous Aeropro Team. It features a 100 sq. in. head with a 10.6-ounce weight. It has a 16x19 string pattern. It’s the latest model since their 2016 model and has increased frame string interaction technology. It has lower power than the previous versions but has increased power than their Pure Aero Lite Model. The Babolat Pure Aero Team Racket is their latest improved model and is a step up from the Aeropro Team Version. It’s designed to be even lighter and deliver more power than their previous racquets. It’s so good that the famed Rafael Nadal uses it. This racquet has a comfortable power grip which allows for great spin and gives you amazing control for a beginner or even an intermediate player. It is more aerodynamic and has slightly less weight which gives it more stability and comfort. When it’s combined with the frame string technology, the new racquet is more power and an even better spin machine. The cortex system filters out any vibrations that may interfere with your gameplay, thus enhancing your feel for the ball. Lastly, it has a shock absorption pad which helps make the game more comfortable and lower impact on your hands. Strung quality string. Supervised by USRSA Master Racquet Technician. Fresh string, no logo. 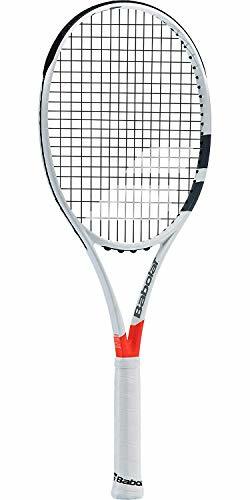 The Babolat Pure Strike Racquet is a step up from their other models and is designed to be used for all players. It’s specifically built to be used for more aggressive play styles and has better control on the court. If you are a power hungry player who delivers the ball with a lot of spin, then the Babolat Pure Strike Racket is for you. It replaces the previous Pure Strike model and features new technology that hasn’t been seen before in a tennis racket. 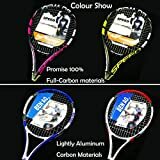 You can change the color of the racket and the size. All the rackets you buy from them are already going to be strung, saving you the time and hassle of trying to put it together. The Babolat Pure Strike Racket has a 100-square-inch head size which can help ensure that you have more precision and time to respond. The FSI technology helps space out the upper crosses of the racquet and helps create a more powerful spin. The newest revision has a hybrid frame construction which combines a square and elliptical constructions to help increase the frame. The wider beam gives you enhanced precision and accuracy when the ball impacts the head. 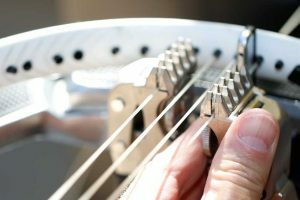 The frame has a higher amount of stiffness, so if your play style requires a softer string you may need to adjust the tension. EXCELLENT BALANCE: Babolat Pure Strike 100 tennis racket is a wonderful combination of spin, control, and feel. This Babolat tennis racquet is perfectly weighted for intermediate players, and its frame is thickened in key locations to enhance power, stability, and precision. RACKET TECHNOLOGIES: Woofer Dynamic String System: Helps string and frame interact with strings being more fee to move - results in greater trampoline effect (power) and shock absorption; Hybrid Frame: Mix of square and elliptical frame shapes help the balance of feel, precision, and responsiveness; FSI Power: Low density string bed increases power, comfort, playability, and most importantly - SPIN! IT IS THE PERFECT HOLIDAY GIFT THIS SEASON FOR CHRISTMAS (X-MAS), hANUKKAH, AND kWANZAA! If we were to choose one of the above to recommend to you, we would have to go with the Head Ti.Conquest Racket. This is because it has an oversized head which is perfect for beginners as it gives you more leeway when it comes to making mistakes and over/under swinging when going to hit the ball. It also features a perfectly sized handle grip which is great for both females and males. 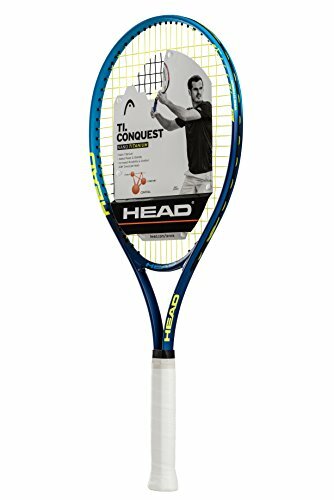 By now your play style has probably been slow to moderate, which the Head Ti.Conquest Racquet is designed for. Just remember, as a beginner you're going to underestimate the importance of a good tennis racquet. The trick that all the pros use is getting a tennis racquet that fits their type of play style. 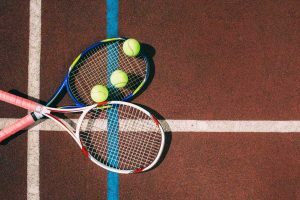 If you want to increase your performance when you're out on the tennis court, then you're going to want to find a tennis racquet that fits your play style. Hopefully, this has helped. Happy playing!